This week Greek officials agreed to deport a Syrian refugee back to Turkey. Without guarantees that his rights will be protected this risks contravening the EU’s established rules on asylum and human rights. Refugees watch a boat come into the harbour at Lesvos. Picture by Victor Roman.Greece is obligated to do so under the EU-Turkey deal agreed on 20 March 2016 where Turkey agreed to take back migrants and police its borders in exchange for $6bn and improved visa conditions for Turks in Europe. The deal was intended to curb the flow of migrants arriving from Turkey to Greece and Italy. The effect has been short-lived. The recent attempted coup in Turkey led to the withdrawal of Turkish police and liaison officers from the Greek islands and saw a new rise in arrivals. Last week Lesvos received over 600 new arrivals, many of them children. A now familiar scene, they were met on the shoreline by strangers bearing space blankets. They were taken to the Moria refugee camp on the outskirts of Mytilene, the capital of Lesvos. Refugees are detained there for up to 25 days after which they can exit the camp but cannot leave the island. Described by many as a prison, the camp has a capacity of 1200 and it is currently home to over 4000 refugees. Sanitation systems cannot cope and there have been reports of the camp running out of bread at crisis periods. Food provision is supplemented by No Borders Kitchen, a band of volunteers who cook and distribute 650 free vegan meals every day on Lesvos, but who are constantly being moved on by the Greek police. Many of those detained in camps have family members resident in other EU states who passaged through Europe prior to the March 20 deal and they have a right to family reunification under the EU’s Dublin III regulation. Following that regulation the onus to start the relevant legal processes is placed on Greece as the country where those refugees first entered the EU. Debt-ridden Greece does not have the resources to do this, consequently few refugees have adequate legal representation for family reunification and this time it is refugees who pay the price for IMF loans. Greece is therefore compelled to commit human rights violations in the three directions set out above: (1) in the deportation of refugees to an unsafe country (the principle of non-refoulement), (2) in the inadequate resourcing of camps, and (3) in the inability to provide effective administration to process asylum and family reunification claims. The right to asylum, the right to freedom from arbitrary detention, the rights to health, education, housing, food, the right to a fair hearing and family reunification are violated as a result of the disproportionate burden placed on Greece to deal with a global crisis. Uncertainty over their legal status has caused growing unrest and discontent amongst refugees on Lesvos. Last week brought protests by refugees on Lesvos. - Around 100 refugees of diverse origin protested outside the gate to port, chanting ‘Open the Borders’, and then came the fire that swept through and destroyed the Moria camp in the early hours of Tuesday 20 September. Thousands of refugees on Lesvos no longer have the security of the camp to sleep in. The effect of law without lawyers is the breakdown of the rule of law. People smugglers are the winners in this crisis. Although not unique to Greece, the refugee crisis is particularly acute here. The desertification of Lesvos by IGOs and NGOs in protest at the 20 March 2016 EU-Turkey agreement has left refugee support services threadbare. In their place, European lawyers are parachuting in to alleviate the strain on Greek services, often offering their skills and services for free. Carlos Orjuela, a charismatic Londoner leads the only legal aid centre in Lesbos. Last year he quit his job as a legal aid lawyer in London in order to volunteer in Calais. Over a period of 5 months he saw thousands of cases and concluded 14 cases of family reunification of unaccompanied minors from Afghanistan who were transferred from Calais to families waiting in the UK. In the Calais Jungle the legal volunteers received death threats from neo-fascists and the legal centre, “the nicest hut in the camp”, built by Carpenters Without Borders was burnt down. There are currently numerous investigations into police violence in the Calais camp pending. On Lesvos legal aid lawyers encounter different challenges. – There is frequent and arbitrary denial of access inside the refugee camps. There are the constantly changing priorities and strategies of the Greek administration, for example in relation to which groups of asylum claims should be processed as a priority. Thirdly, asylum decisions issued by the Greek authorities are issued only in Greek, volunteer lawyers are required to find and fund a translation. I learnt of a 15 year old Syrian Palestinian seeking reunification with her mother in Germany. 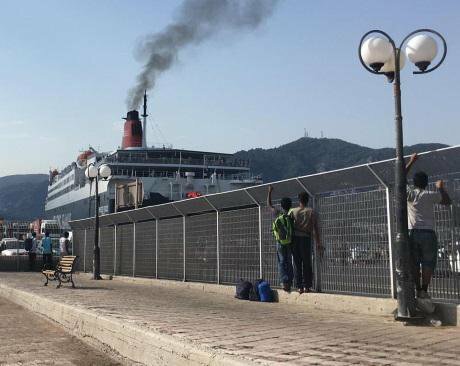 Despite having a strong claim for family reunification and despite having an appointment with the German embassy in Athens for reunification with her mother, and volunteers ready to assist her safe passage, the daughter may not be able to gain permission from the Greek authorities to leave the island of Lesvos in time to make the appointment. There are also those cases where family members may not qualify as minors but are dependent on family members. For example, a 20 year old Afghani man suffering mental health problems who is not legally directly entitled to travel with his parents and younger siblings on his father’s skilled labour visa. The ability of the Legal Centre Lesbos to survive long enough to conclude these cases depends on crowd-funding and donations. The EU Dublin regulation is widely acknowledged to have not been designed to cope with a crisis as great as the current refugee one. Reforms have been tabled at the European Commission and are expected to be adopted by the Parliament and the Council through a co-legislation process promptly, although no date has yet been released. The proposals do not provide for resourcing the army of lawyers and interpreters required to make the system workable in practice however. Earlier this week at the UN Summit for Migrants and Refugees in New York, the UN promised to step up its efforts to turn the tide on the global refugee crisis. Resourcing and restoring legal infrastructures in Greece should be amongst their first concern. In not doing so, the refugee crisis that can be resolved spills into a rule of law crisis that cannot. Names and identification details have been changed. Donate to the Lesvos Legal Centre here.